To confit basically means to slow-cook an ingredient in fat. The term is often associated with duck confit, but can be employed for a host of ingredients. Confiting egg yolks is a modern technique, great for adding a little cheffy flair to home-cooked dishes. Alternatively to this method you can confit egg yolks sous vide. You can use bacon fat or different flavoured oils, such as rosemary or garlic, as the confit – this adds another flavour dimension to the dish that you can use to complement other ingredients on the plate. Adam Simmonds pairs confit yolk with confit duck, asparagus and cobnuts, the buttery egg yolk making a rich and satisfying sauce. 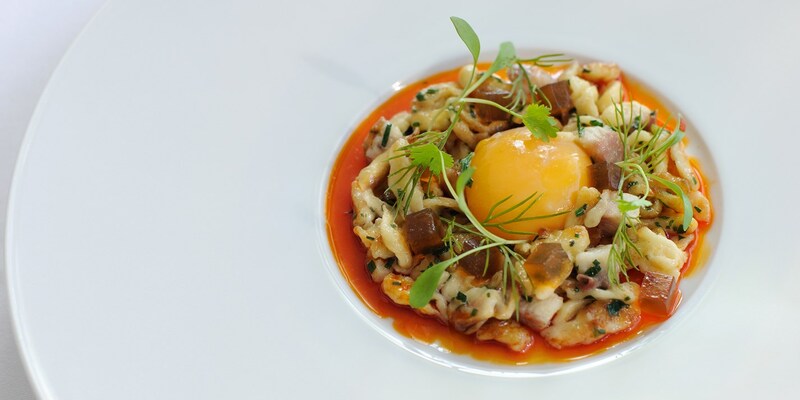 Nuno Mendes matches the confit yolk in his dish with confit cod, saffron, garlic and citrus, perfectly balancing salty, rich and fresh elements.